"...a wonderful ensemble, both in the technical sense and as an atmosphere that emanates from the stage." "The arrangements were skillfully done. The playing was excellent"
"Brass Quintet adds zaniness to its talents. Diverse material combined with imaginative presentation marked the engaging concert"
"A delightfully varied program and five extraordinary brass players"
"Best Small Classical Ensemble Award - 1994"
"Brass Quintet wows audience... standing ovations and shouts of praise"
"The crowd went quadruple bananas"
Like you've never heard Renaissance before! Dance Suite No.2 from "Terpsichore"
Dances from the "Pariser Tanzbuch"
Variations on the Romanesca -- Anon. 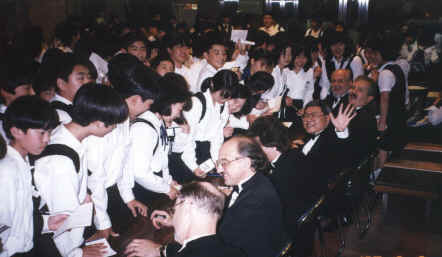 above: signing autographs after concert in Japan. Allan lived for many years in New York City, performing with the New York Brass Quintet, the New York Cornet and Sacbut Ensemble. As a top call freelance concert and recording artist he worked with Leonard Bernstein, Igor Stravinsky and a virtual Who's Who of the greatest musicians and composers of the 20th Century. He is a founding member of Summit Brass, and is also a renowned player of the cornetto in the group "Calliope: A Renaissance Band." He has performed at the Norfolk Chamber Music Festival, Casals Festival, Spoleto Festival, U.S.A., Banff Centre for the Arts, and Prairie Home Companion. He formerly taught at the Eastman School of Music, Manhattan School of Music, and Indiana University, and he has students in key positions throughout the world. Ray is a founding member of the Tone Road Ramblers, a new music ensemble started in 1979 in NYC made up of composer/performers who commission and perform only new pieces. Since 1993 they have been a resident ensemble at the Ragdale Foundation -- an artist colony in Lake Forest, Illinois. Ray has also commissioned many new works for trumpet, most notably with the Cleveland Chamber Orchestra, for the International Trumpet Guild, and the Jazz Members Orchestra of Chicago. He has recorded on CRI, Deutsche Grammophon, Ubres, Crystal, Summit, Einstein and TR2001 recordings. He has also served on the Board of Directors of the International Trumpet Guild. Tom has held principal horn positions with the Syracuse Symphony, Detroit Symphony, Houston Symphony and the Berlin Radio Symphony, and has performed in "guest" principal positions with the Berlin Philharmonic, Pittsburgh Symphony, Milwaukee Symphony, Chicago Symphony, Fort Worth Symphony, and many other orchestras. He has performed in Europe, Africa, Asia, North and South America, and has been featured soloist on international tours with the Amati Ensemble, the Berlin Radio Orchestra, and Mikhail Baryshnikov's White Oak Dance Project. He has played with over a hundred orchestras across the United States, at major music festivals throughout the world, and has made ten solo recordings. He is editor of "The Complete Hornist" series for Southern Music Company, and has given master classes and clinics at hundreds of universities and colleges around the world. For many years Mel was Bass Trombonist with the Saint Louis Symphony Orchestra, having joined the orchestra right after graduating from the Curtis Institute of Music. He is the founding member of the Saint Louis Brass Quintet and is also a founding member of Summit Brass. In addition to his performing duties, Mel manages Primo Concerts, which handles bookings for the Saint Louis Brass Quintet, Summit Brass and The RiverCity Ramblers, a Dixieland jazz group. He is a recording and television producer as well as an arts manager, and has served on various committees and/or boards of the Missouri Arts Council, the Mid-America Arts Alliance, ACUCAA, Young Audiences St. Louis, Summit Brass and Summit Recordings. Dan, or "Mr. P" as he is called by his students, is a renowned tuba soloist, clinician, chamber musician, instrument designer and master teacher. He has been a featured artist at Carnegie Hall, the Monterey Jazz Festival, the Spoleto Festival U.S.A., the Adelaide Festival in Australia, the Banff Centre for the Arts in Canada, the Montreux Brass Congress in Switzerland, and as soloist throughout Japan. He is a founding member of Summit Brass, a member of Symphonia, the Matteson - Phillips Tubajazz Consort, and has released numerous solo and chamber music CDs. Along with Robert Tucci, he designed the "Perantucci" line of low brass instruments and mouthpieces that has become the equipment choice for thousands of low brass players worldwide. He also serves as the vice-president of educational matters and consultant/clinician for Custom Music Company. 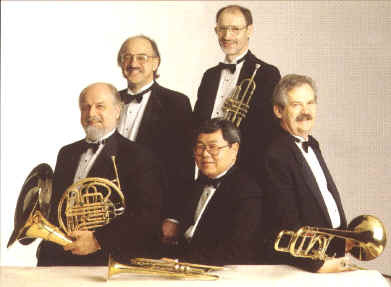 The Saint Louis Brass Quintet performs the entire spectrum of great music for brass - from the works of today's composers to Baroque and Renaissance music transcribed for modern instruments. For many audiences they also offer lighter fare: popular music of the Americas, jazz arrangements of standards by Ellington/Strayhorn, Gershwin and Cole Porter, lighthearted pieces for narrator and brass; and a tongue in cheek survey of the history of the brass instruments. The group also presents children's programs, master classes and workshops. Trumpeter Allan Dean wrote many of the arrangements played by the group, and composer/trumpeter Anthony Plog wrote two works for the group when he was a member (Four Sketches for Brass Quintet and Animal Ditties #8 for Brass Quintet). Most of the jazz arrangements the group plays are done by Joey Sellers (a former student of Dan Perantoni's). On some tours the SLBQ performs with percussionist Gray Barrier on drum set and with an array of smaller instruments. Enhancing the swinging beat of the jazz arrangements, or adding the perfect effects for some of the Renaissance arrangements he provides an element that greatly enhances the quintet's concert presentations. The SLBQ sees itself foremost as a serious chamber music group, but also recognizes the importance of education and entertainment in its programming. Finding this balance is an exciting challenge that is vital in keeping both the group's members and its audiences satisfied. With each of the members living in different cities in the U.S., the only time the group gets to rehearse is when they are together on tour. One day before a tour starts, everyone travels to the city where the first concert will be. There is one rehearsal that evening, and another on the morning of the first concert. Then the tour begins. During the tour, whenever there is a day or even an afternoon off, the group will rehearse any music necessary for concerts on the next tour. Parts for any new pieces are sent out weeks in advance. Usually one player will already know the new piece, and serve as "director" in helping the group put it together. The driving philosophy of making music with the SLBQ is to communicate through the music - whether in concert or in practice. Rehearsal technique is very simple: lots of playing, not much talking. The group's interpretation is arrived at by mutual respect for each other's musicianship; words are often just not necessary.